DESCRIPCION CORTA: 1:16 Scale CARFIRE REMOTE CONTROL TRUCK: Four-wheel drive and four-direction control support the actions like racing forwards, backwards, left, right, 360 degree stunt flip rotation spinning, double sided running, 3D Deformation, rolling handstand walking. No need to prep or build your truck, just charge it and you're ready to hit the trails. If you are already thinking about the holiday season, we totally recommend rc car as a perfect Christmas gift for all the kids 8 years and up. 2.4GHZ RADIO SYSTEM & HIGH-CAPACITY RECHARGEABLE BATTERY :The long range 2.4GHz radio system is always in command, RC car will be able to play together and not interfere with each other at the same time. And rc car is equipped with two powerful rechargeable 4.8V 500 mAh battery pack for a long life performance. RC CAR DETAILED INTERIOR: All-weather electronics rule over the elements for driving fun through streams, mud, and snow. Carfire remote control car is perfect for any age driver or skill level and comes fully assembled, painted, and Ready-To-Explore with included rechargeable two battery pack,USB charger and 2 AA batteries for the transmitter. Everything you need is included in the package. REMOTE CONTROL CAR WARRANTY: We stand behind our products 100% and guarantee that your set will arrive free of defects and in perfect condition. If you have any issues, contact us and we will make things within 24 hours. DESCRIPCION LARGA(contáctenos para traducir): Remote control cars and trucks have always been a childhood favorite for generations of kids.This desert buggy is a perfect RC buggy to get your kids started into the RC Car Hobby! 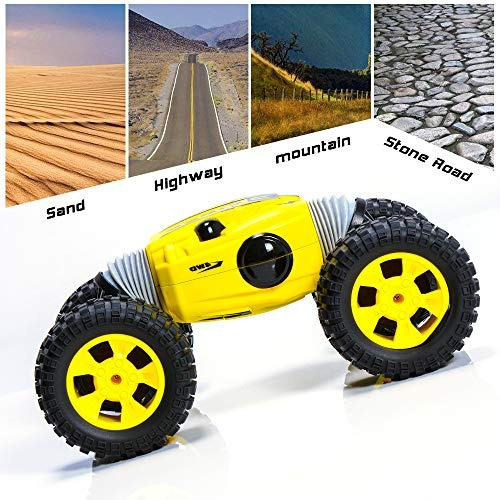 Remote control vehicles are also educational as well, they can encourage learning in areas of technology and electronics.Your kids will love to play with this toy! Nowet get the realistic 4WD 1:16 RTR RC Car for your child today! ¿Realistic 1:16 scale desert buggy design make this feel just like the real thing! ¿Rugged rubber tires provide a solid performance and stability on all surfaces. ¿Speeds up to 15 km/h , in your backyard and everywhere in between. ¿Full suspension system mean that nothing is too tough for this beast. ¿Front and real bumpers can protect the car from crash. ¿4 Wheel Independent suspension system . ¿Full Function Control of forward/reverse/left/right and stop. ¿Package with USB charger gives you the convenience of charging. ¿It is Ready to Run. All you need to get started are 2 AA batteries for the transmitter!